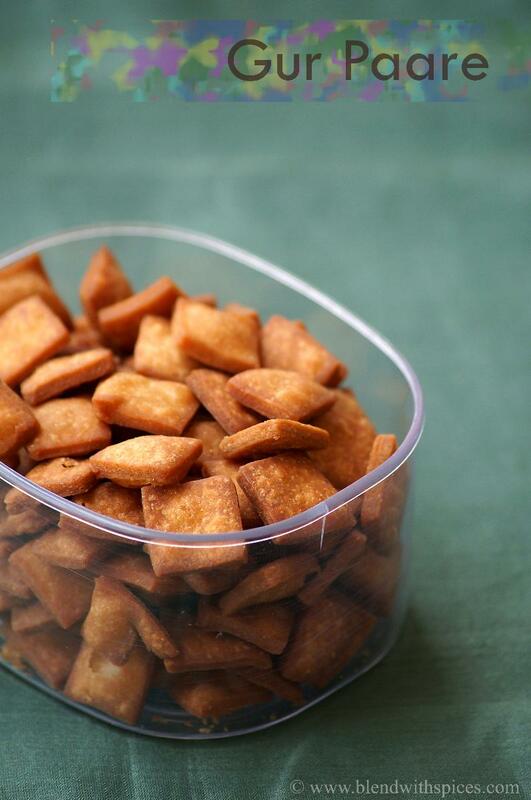 Gur Pare or Gur Para Recipe – Easy, delicious and addictive crunchy bites made with wheat flour and jaggery. 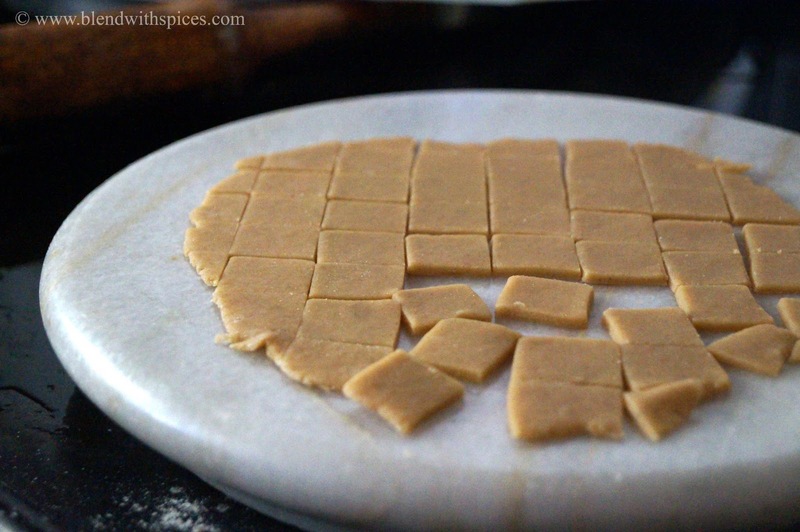 Gur Para or Gur Pare is a sweet snack from India made with whole wheat flour and jaggery. 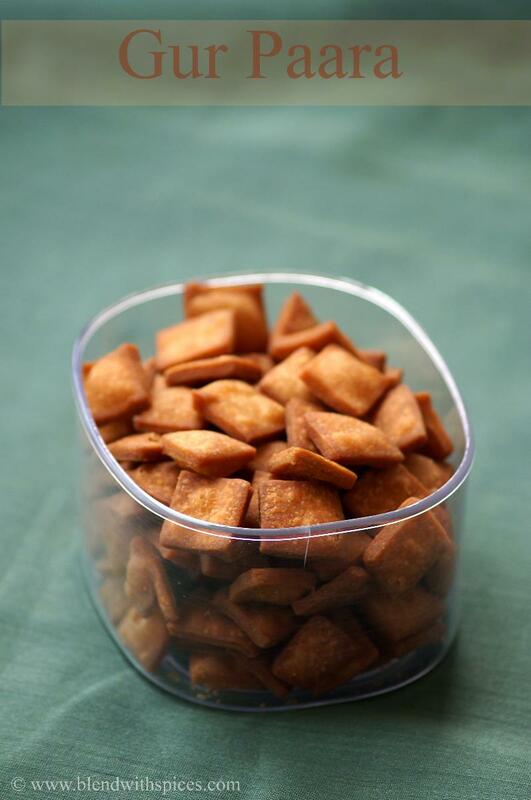 These crunchy bites are mildly sweetened with jaggery and flavored with freshly pound cardamom powder. This gur para recipe is very similar to Shakarpare where the fried dough bites are coated with sugar syrup. There are two variations to make these delicious and addictive gur paras, one is with jaggery syrup and another one is without jaggery syrup. 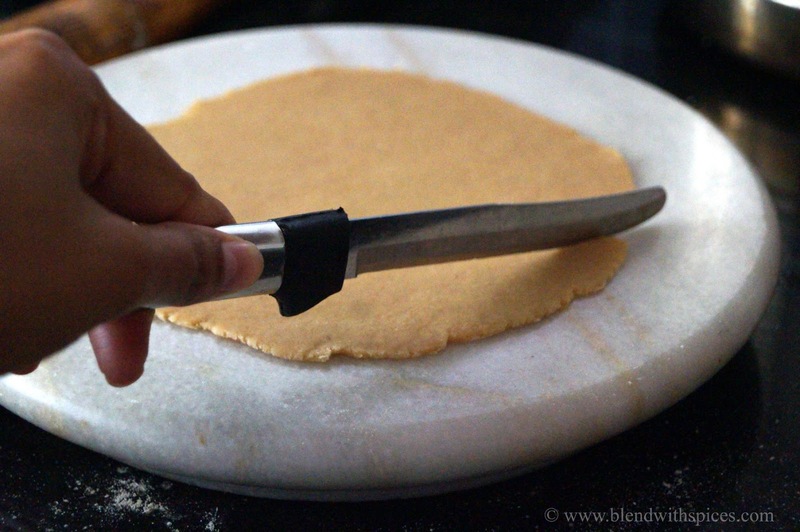 Instead of coating them with jaggery syrup, we are adding the jaggery water to the dough. I will share another variation sometime later. The best part of this recipe is they not only so easy to make, but they can also be stored up to 3-4 weeks. 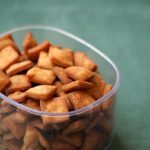 And this recipe is so versatile, you can prepare them beforehand during festivals such as Diwali, Holi, Rakhi or Krishna Jayathi. Also, these can be served as a tea time sweet snack. Make sure you mix the flour and slightly heated ghee together well to make the crunchy gur para / gur shakarpare. The dough should be stiff. Fry a few of them at a time. Do not overcrowd them. Do not fry on a high flame nor very low flame. 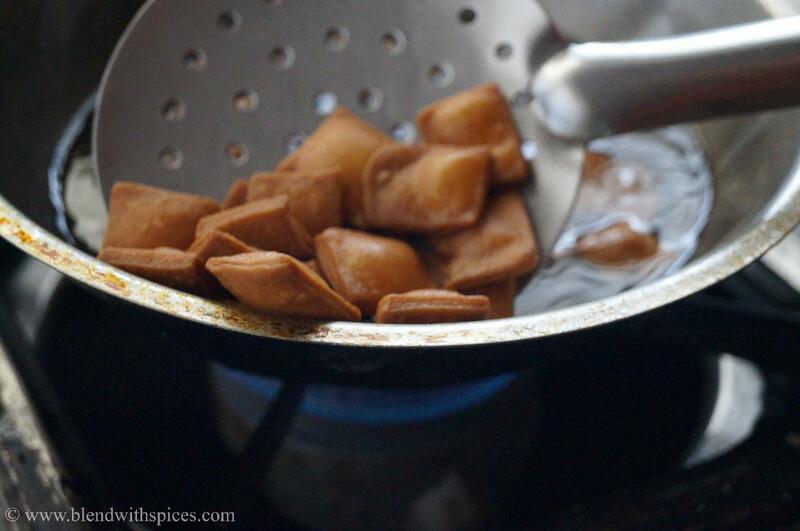 An easy and delicious Indian sweet snack made with whole wheat flour, jaggery and cardamom. A perfect recipe for Diwali or Holi. Take water and powdered jaggery in a bowl. Heat until the jaggery dissolves completely. Combine the wheat flour and cardamom powder in a mixing bowl. Add slightly heated ghee and mix well to get a breadcrumb-like texture. Then add the cooled jaggery water to the flour and mix. Make a firm dough by adding normal water little by little. Cover the dough and keep aside for 30 minutes. Knead the dough and divide into 6 – 7 equal portions. Roll the dough ball into a thick circle. Cut the rolled dough into diamond or square pieces. Repeat the same process with all the dough portions. When the oil becomes hot, reduce the flame to low. Gently drop the dough pieces in the hot oil. Deep fry them on a low-medium flame until brown color, turn over to fry on both sides evenly. Drain them on paper towels and let them cool completely. You can substitute the wheat flour with all purpose flour or plain flour. Combine the measured water and measured jaggery in a vessel and heat until the jaggery dissolves completely. Remove the vessel from the heat and let it cool completely. Filter the jaggery water to remove any impurities. In a mixing bowl, add the measure wheat flour and cardamom powder. Add the slightly heated ghee or clarified butter and mix very well to get a breadcrumb-like texture. Now add the cooled jaggery water to the flour mixture and combine. After 30 minutes, knead the dough again and divide it into 6-7 equal portions. Dust each dough portion with some wheat flour and roll into a thick circle. Cut the rolled dough into diamond or square pieces using a knife or cutter. Repeat the same process with all the dough portions. 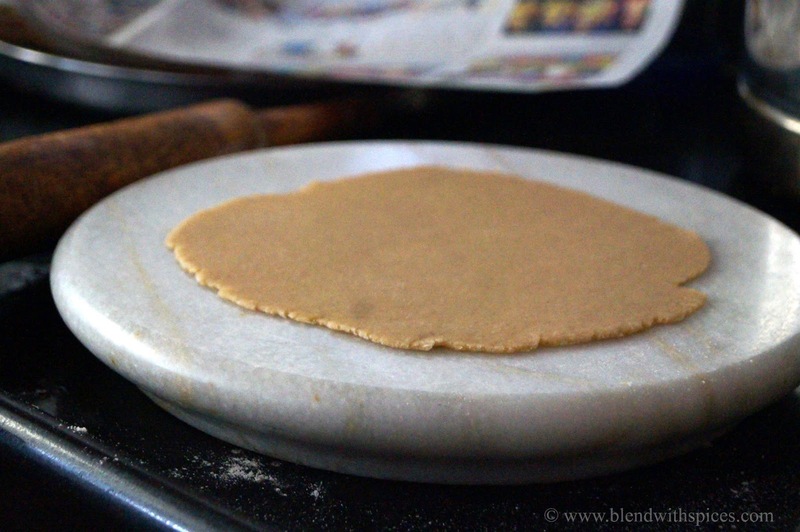 Cover the dough pieces with a paper or plate to prevent them from drying. Heat oil in a pan for deep frying the gur para. When oil becomes hot, reduce the heat to low. Carefully drop some dough pieces in the hot oil and deep fry them on a low-medium flame until brown color, turn over to fry on both sides evenly. Make sure you fry a few at a time, without crowding. When they are cooled, store in an airtight container and serve as a sweet snack. Nice recipe and superb clicks! Wow nice recipe.really love this recipe. crispy and crunchy to look at gur para recipe. This is what I call as unputdownable snack. Wow! cruncy gur para. Yummy.. I like these crispy paras! Appealing Clicks, very well presented.